The Altantuya Murder Trial has dragged on aimlessly for a whole year with the anticipated effect that most spectators have dozed off in their seats. To anyone with more than half a brain cell in their skulls, it certainly appears that Malaysian Justice is as elusive as the legendary Big Foot. Especially in view of the latest postponement of the trial on the very day Dr Shaariibuu Setev, the murdered woman's father, arrived in Kuala Lumpur to look in on the so-called trial's progress (or lack thereof). As a result, Dr Setev has decided to return to Mongolia - after giving a press conference at which he stated that his government is on the verge of severing all ties with Malaysia. The fact that the Malaysian Prime Minister has failed to acknowledge and respond to a formal letter addressed to him from his Mongolian counterpart is an utterly deplorable and disgraceful lapse in manners and reflects very badly on all Malaysians. As a Malaysian I'm absolutely embarrassed and appalled that such a blatant charade has been permitted to drag on and on for so long while everybody pussyfoots around the thorny question of the Deputy Prime Minister and Defence Minister's involvement in the whole sordid affair. A man who has long been under a thundercloud of suspicion - not only over spectacular irregularities in defense expenditures but also over the gruesome murder of Altantuya Shaariibuu - has been anointed as the next Prime Minister of Malaysia. This same man is on record as having unsheathed a keris during an Umno assembly in 1987 and called for Chinese blood! And yet the Malaysian media remain mute on the obscene grotesqueness of the situation. By way of sincere apology to Dr Shaariibuu Setev and the Mongolian people, I dedicate this blogpost to the memory of a brave and beautiful woman who had the misfortune to fall into very bad company. ANWAR TO NAJIB: "Nothing personal!" ANWAR TO NAJIB: "Explain photo with Altantuya Shaariibuu!" Deputy Prime Minister Najib Abdul Razak has been asked to explain the claim made in a court testimonial today that he had been photographed with murdered Mongolian national Altantuya Shaariibuu. PKR de facto leader Anwar Ibrahim said it was all the more compelling for the deputy premier to explain since he had previously denied having met her. All ties established between Mongolia and Malaysia may be severed if the courts do not reach a fair decision in the Altantuya Shaariibuu murder trial. Altantuya's father, Dr Shaariibuu Setev, told a press conference that this has been communicated to the Malaysian government. 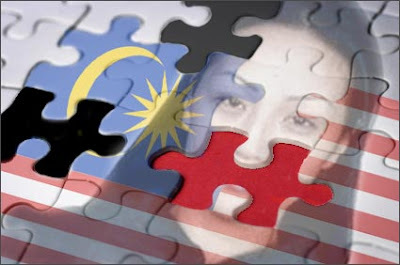 Altantuya Shaariibuu's cousin told the High Court here today that in August 2005, Abdul Razak Baginda and Altantuya were still having a relationship as they traveled to "Europe, France and Italy" together. Burmaa Oyunchimeg, also known as Amy, 26, in reply to a question from the prosecution, said Altantuya had shown her a photograph of her with Abdul Razak and Malaysian government officials. Later, when asked by Karpal Singh, who is holding a watching brief for Altantuya's family and the Mongolian government, Burmaa said the photograph was shown to her in Hongkong, on Altantuya's return from France. Burmaa: There was a picture of Altantuya having a meal on a round table. Altantuya having a meal with Razak Baginda and Malaysian government officials and other people. Karpal: Who were the government officials in the photograph? Burmaa: Najib Razak. I remember the name Najib Razak. I remember Razak is the same name. I asked her (Altantuya) 'are they brothers' because they have same name. Even Adli Syahril's video on the purported execution site is very touching. I wonder if we shoud conduct our own special prayers there to give closure to her soul. One cannot imagine that this is a 3 person crime as it will take a lot to have even plan out the route and timings involved and hiding her from further public traces. It must have involved more accomplices. How can we go on our lives when we know that some rank and file out there know of such and even more murders before? Are they untouchable? There should be a public inquiry. Allay people's fears. Hi Adli! Glad you're happy about my using your video which provides a dramatic glimpse of the spot where Altantuya Shaariibuu was blown to pieces. The gruesome footage was nicely offset by the youthful innocence of your emotional response to it all. Thank you for taking the trouble to locate the secret killing field.